Imagine a landscape of glittering blue ice, a sheer ice cliff towering over a wind-swept meltwater-laced tundra that stretched to the edge of the continental shelf. That was New York circa 22,000 years ago. 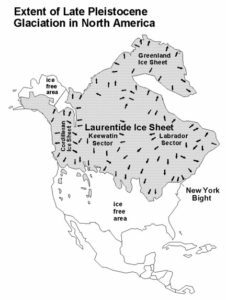 New York City marks the southernmost boundary of an ice sheet that mantled much of North America, advancing and retreating over a period of around 90,000 years. 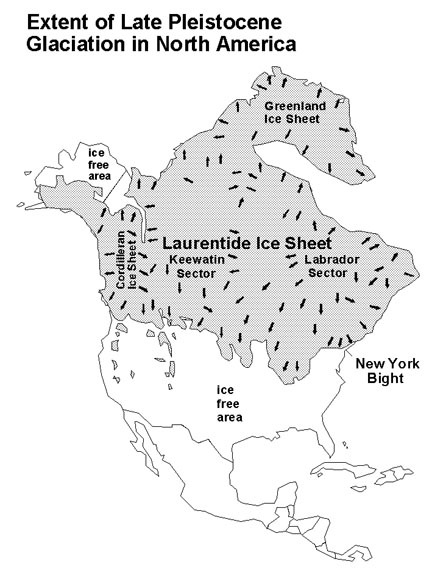 The last glacial advance of the Wisconsin Ice Sheet reached New York City between 22,000 and 20,000 years ago. Ice covered Manhattan Island and the Upper New York Bay, the northern tip of Staten Island, and the northern half of Long Island. At its thickest it was taller than the Empire State Building, perhaps 2,000 feet or more, making it taller than our tallest building, the Freedom Tower, according to recently revised estimates. Sea level was 350 feet lower than today, and from Cape Cod southward, the coastal plain jutted out 50 to 100 miles further than our present-day shoreline, almost to the edge of the continental shelf. The plain was a wind-swept tundra laced with a network of icy meltwater streams. Only the most tenacious species of plants and animals could survive in the harsh conditions. Shrub willows, birches, sedges, grasses, and tundra herbs provided forage for herds of woolly mammoth, musk oxen, and caribou. Deer, elk, and mastodons browsed in patches of pine forests and black spruce swamps. Moose and giant beaver frequented glacial lakes and bogs. These herbivores were the prey of such carnivores as the timber wolf, dire wolf, bobcat, cougar, lynx, and giant short-faced bear—and by at least 12,000 years ago, the omnivorous human hunter. 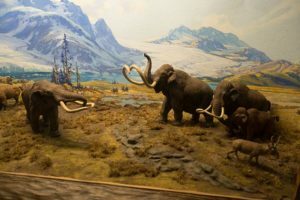 We know from archaeological excavations at Port Mobil, Staten Island, that Paleoindian hunters set up camp on what was then a 75-foot-high promontory overlooking a vast outwash plain (now Arthur’s Kill), where herds of mastodons and mammoth and other animals grazed. The promontory gave them a good view of their quarry below as they sharpened their stone spear points and planned for the hunt. The glacier was hardly a static sheet of ice. It was a moving river of ice. It surged down the Connecticut and Hudson river valleys and spread like a skirt from New Jersey to Long Island. 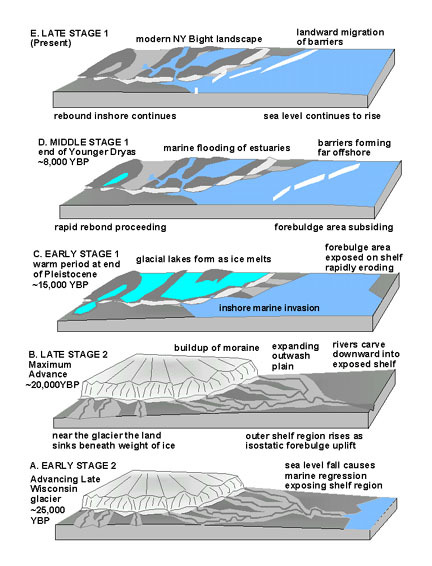 As it slowly ground its way over the region, the ice river scraped the land down to bedrock, excavating huge boulders and depositing tons of sediment and debris as it melted back. 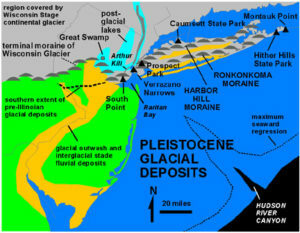 The advance and retreat of glaciers literally created Long Island and carved out the landscape we know today as New York City. Moraines, lakes and ponds, kettle holes, peat bogs, meltwater streams and valleys are all the relics of glacial topography. 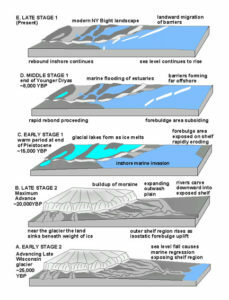 Around 18,000 years ago, the glacier began retreating from the region. Between the receding ice front and terminal moraines, huge lakes formed from meltwater. By 12,000 years ago, the rising sea breached the moraines at several points. 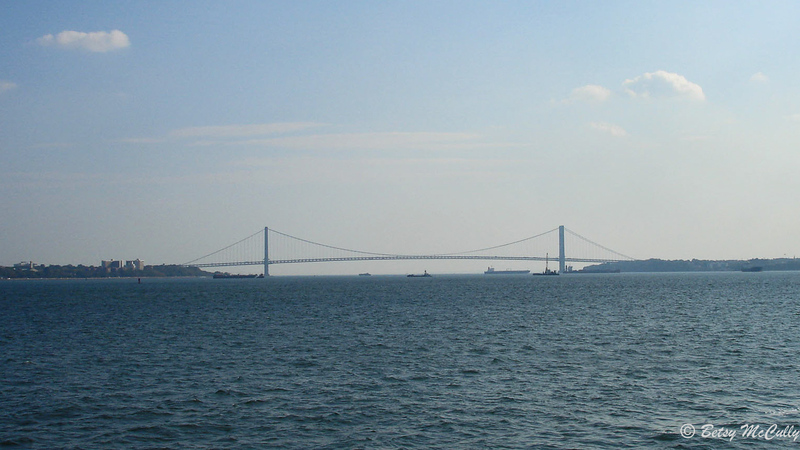 At the Verrazano Narrows, a terminal moraine once connected Long Island and New Jersey like a land bridge, acting as a dam that held back a huge freshwater lake, Lake Hudson, now New York Harbor. When the dam was breached, the water of the pent-up lake gushed through the gap with such force it sluiced through hundreds of feet of glacial sediment and roared into the ancient Hudson River channel, coursing to the continental edge. The Hudson River, which had been diverted by the glacier, now flowed into its ancient channel. The canyon it carved, now drowned, is known to fishermen as the Hudson Canyon. Global warming accelerated 10,000 years ago, triggering rapid changes in plant and animal life. It’s possible Paleoindians witnessed the changeover from spruce to pine forest in a single lifetime. As pines quickly colonized the region, tundra retreated northward, and with it, the animals that grazed on it. Some of the mammals that thrived at the edge of the ice, caribou and elk among them, shifted northward with their habitats, but many others died out in what is termed as the “Great Wave of Extinctions.” Worldwide, 35 to 40 species of large mammals and a few smaller species became extinct. Most of the extinctions were in North America. What accounts for the mass extinction of mega-fauna? No doubt climate change subjected the great mammals to stresses they could not adapt to fast enough. And it’s quite likely that overhunting pushed them over the brink into extinction. The great beasts are forever gone. We have only fossil remains that tease our imaginations. Mastodon bones have been unearthed in peat deposits in the Harlem River and 22 feet below ground at Broadway and Dyckman Street in Upper Manhattan, and mastodon and mammoth teeth have been trawled by fishermen from undersea banks off the Atlantic Coast. 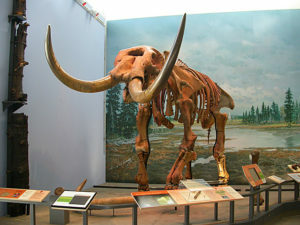 A little further afield, in Hyde Park, Duchess County, New York, skeletal remains of a mastodon were discovered in a suburban backyard in 2000; it is now reconstructed and displayed at the Museum of Earth, Paleontological Research Institution (PRI.org). In the post-glacial age known as the Holocene, our era, sea levels continued to rise, reaching their modern level and stabilizing around 6,000 years ago, when the New York archipelago emerged. New York City is really a city of islands: Manhattan, Staten Island, and Long Island are the most prominent, but myriad other smaller islands dot the great Hudson-Raritan Estuary that bathes the New Jersey and New York coastlines. One of the best places to experience New York’s glacial terrain is Long Island. 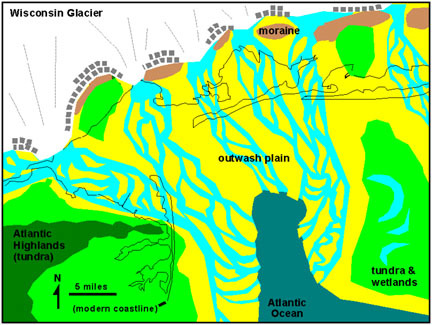 The southern half of Long Island is a broad outwash plain created by the meltwaters of the receding glacier. The northern half, separated from the southern half by glacial moraines that form Long Island’s backbone, is a knob-and-kettle landscape of moraines and glacially-carved valleys and kettle holes. Ronkonkoma Lake, for example, is a huge kettle hole that sits in the Ronkonkoma Moraine, the oldest of two terminal moraines on Long Island, formed around 70,000 years ago. The younger Harbor Hill Moraine that once spanned the Narrows was created around 20,000 years ago. 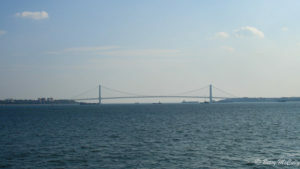 The Verrazano Bridge spans the breach in the Harbor Hill Moraine that once stretched from Brooklyn (right) to Staten Island (left). The breach is now known as The Narrows. Several good exposures of glacial till on Long Island’s North Shore are open to the public. The beach bluffs at Garvie’s Point Museum and Preserve reveal a clay-and-sand Cretaceous layer excavated by the last glacier from the valley of Long Island Sound, itself a glacial relic that was once a glacial lake until the sea flowed in. The Cretaceous layer in the cliffs of Garvie’s Point are overlain by a thick layer of pebbly outwash capped by reddish till, desposited by the receding glacier. The 126-foot-high bluffs of Caumsett State Park at Lloyd’s Point offer beautiful exposures of pink-and-white sands and red clays of Cretaceous age. The low eroding cliffs of Target Rock National Wildlife Refuge expose Cretaceous sands beneath ascending layers of reddish brown till, yellowish outwash, brownish till, and loess (windblown deposits); in the higher bluffs you can see rippled layers of clay and fine sand deposited at the bottom of a lake that formed between the receding glacier and its moraine. North Shore beaches were once littered with erratics—boulders ferried by the glacier and left behind as so many calling cards. Unfortunately, many of these ice age relics were removed when residents wanted a nice sand beach. But there are several places preserved from development and privatization, such as Target Rock NWR and Garvie’s Point Preserve, where they may be found. At Garvie’s Point, you can see crystalline basement rock of gneiss that the glacier excavated from the Adirondacks and basalt boulders quarried from the Palisades. Smaller erratics include rounded Cretaceous-age concretions known as “Indian paint pots,” presumably because the red clay enclosed in the iron oxide crusts was used by the early Americans for pigment. As the sea continues to encroach and erode the bluffs, more glacial debris will wash out.